Over the weekend El Pollo Loco introduced their new Grilled Chicken Tortilla Roll. It has citrus-marinated, grilled chicken with Jack and cheddar cheeses rolled in a flour tortilla and grilled. 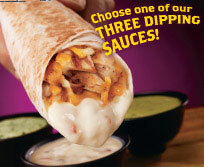 The Tortilla Roll comes with a choice of 3 dipping sauces: avocado salsa, creamy cilantro, or queso sauce. It sells for $1.99. "Despite their increasingly demanding schedules, people today want far more than fast food," says Karen Eadon, chief marketing officer for El Pollo Loco. "They seek bold flavor, great value, and the opportunity to customize menu selections to their individual tastes. El Pollo Loco's new Grilled Chicken Tortilla Roll delivers on all accounts and is served with a choice of dipping sauce from three signature recipes available only at El Pollo Loco." 387 Calories, 144 calories from fat, 16 grams of fat. i am eating one right now. it is not that great. I'm with ya. Not worth all the fat and 400 calories. Not wanting a big meal, I ordered the Grilled Chicken Tortilla Rolls and found them to be exactly what I needed. (Only ate one because that was enough for me to be satisfied. 8 pts. on the weight watchers scale.) Great taste, Great value, Will definitely order again. They are really good with the creamy cilantro dipping sauce. Worth it!